Hello again! It's another guest post from yours truly, Ashley's husband Nate. I had almost forgotten to prepare a post for this weekend, but was lucky enough to remember, and Ashley was lucky enough to get the spoils of this recipe. My weekly recipe might not always happen on Saturday, but I'll do my best to post as regularly as my darling wife does. 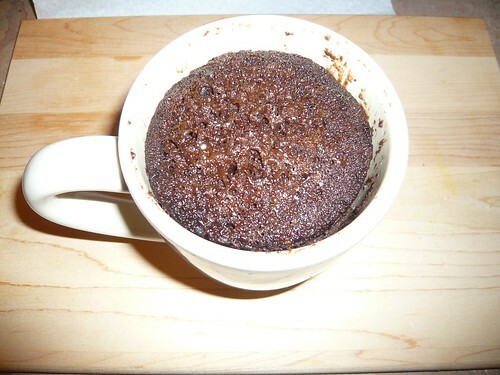 I've seen recipes for Chocolate Cake in a Mug all over the internet, and I'm sure you could too with only the most rudimentary of Google skills. What I've done is look at as many of those as I could find and adapt it to sort of make it my own and find what works and tastes best. Now that I think I have it down pretty well, I want to share it with all of you! This is perfect for if you ever have a late-night sweets craving, and you have nothing already prepared and everywhere you can order food from is closed. It only uses the most basic of baking ingredients. 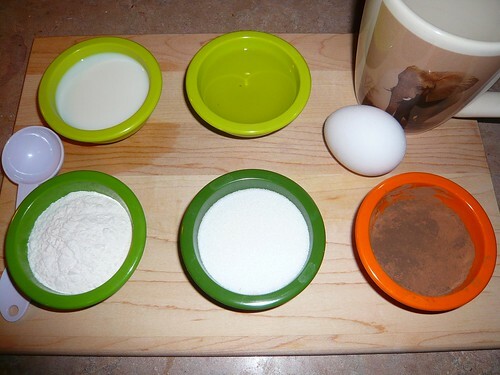 * Dutch-process cocoa powder gives a much more chocolate-y taste to your cake. 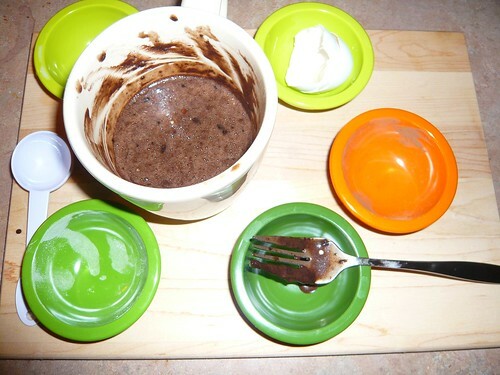 I've found a good compromise is 1 Tbsp regular cocoa powder and 1 Tbsp of Dutch-process cocoa powder, but this is something that can easily be altered to your tastes. ** You can substitute water for milk if you are lacking milk. This recipe lets you go from nothing to single-serving cake in about five minutes! I hope you enjoy it! Please comment to let me know how you like it. All the ingredients mixed together. Just to give you an idea of the consistency you should expect. The cake will rise out slightly. 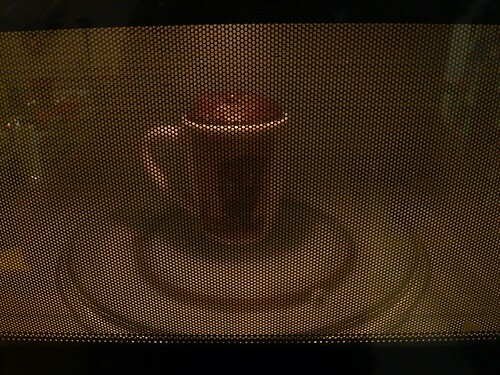 It will probably come out more for you, as I used a fairly big mug, but you have no reason to worry. This is not great for my diet that is supposedly starting today!! Ugh. Looks so good. And easy!! I’m a big fan of the Chocolate Cake in a Mug recipe, too. In fact, I’m also the author of “101 Recipes for Microwave Mug Cakes” that builds on this recipe (but, hopefully, adds some ideas and baking tips for those who love microwave mug cakes as much as I do). Check it out at http://www.microwavemugcakes.com.